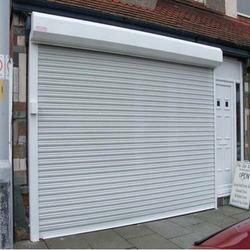 Prominent & Leading Manufacturer from Thane, we offer rolling shutters. Rolling Shutters is powered by 230 V current. The motor moves reliably and precisely and is available with an emergency maneuver which can be used during black-outs to action the rolling shutter. Automated rolling shutters avoid any effort for opening/closing, and guarantee perfect closure of the home in your absence. Full range of motors for industrial sectional doors, roller shutters, high-speed doors.